…What had shredded us apart? …Puzzled on what had happened to us? …O God where are you from us now ??? My friend Nasra.Loved this one Pure and beautiful.He!He!He!. I remember reading somewhere"Do you know what a man of earth may be,Khayyam A lantern of imagining,and inside a lamp". 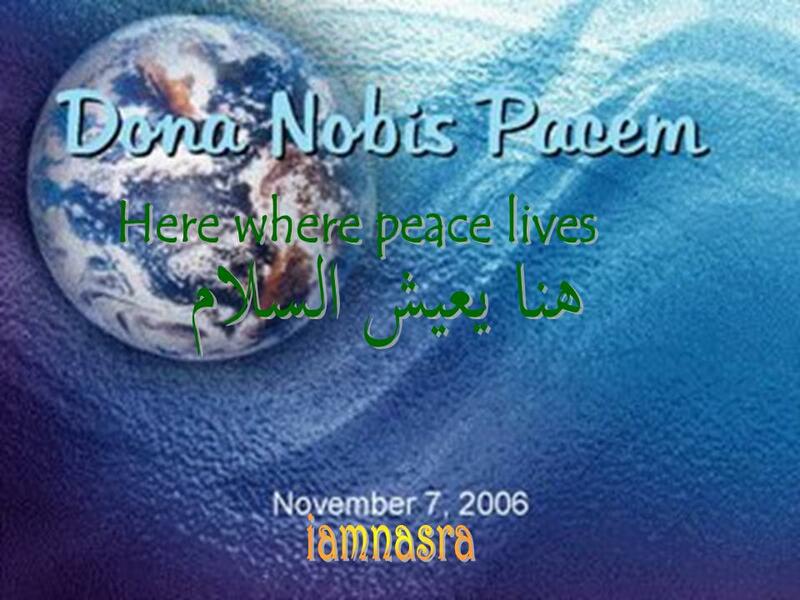 i c wat u meant by peaceblog, i work on dat. how can I join the peace thing? more details plz? A very good poem from you. This is like a warning from a holy book. I loved the two voices. Wonderful poem, straight from the heart. However you find it wherever it may dwell...peace be with you always. Another beautiful piece. You are very talented. I think you have my thoughts in your poem. It seems like we humans are in such a mess, like children without parents. I think it is in our hands - in the way we reach out to each other and embrace through the distance that we erase all borders and creeds to speak only the language of compassion/understanding and love. and how would joining this would bring peace? I clicked on the link you provided and it took me to a comments page .. and how would that bring about peace? Even ruined their own kind"
Powerful and truthful words! I loved this sister Nasra :-) A lot of troubles in the world is because people are lost without guidance and they thought giving up God would bring happiness and peace, but it has not. You have a beautiful voice. What a beautiful post and poem. I feel such a peaceful spirit here and am honored you have joined the initiative. I am still finding globes nestled here and there. I've made mention of you and your blog in my post tonight.